After a disappointing 2014-15 season that was riddled with injuries, the Oklahoma City Thunder enter the 2015 NBA Draft with a sense of optimism. If Kevin Durant, Russell Westbrook, and Serge Ibaka can remain relatively healthy next season, then this team is still a championship contender. With that said, the Thunder are basically playing with house money when it comes to this draft. Will they be drafting an integral piece to the present championship puzzle? Maybe. Or maybe they’ll be drafting a piece that won’t pay dividends for another year or two. Or maybe they won’t be drafting anyone at all. There are a ton of options at the Thunder’s disposal and this draft is shaping up to be one of the most active for the team. Here’s a look at 10 prospects the Thunder may draft at different stages in the draft. There have already been rumors that the Thunder are looking to trade Jeremy Lamb, Perry Jones, and Steve Novak ahead of the draft. While this group of players isn’t necessarily attractive to most teams, to a team needing perimeter shooting, this haul may be a steal. There are two teams in the draft that are desperate for shooting and have already made moves this offseason to shore up that need. Detroit, under the direction of Stan Van Gundy, is looking to surround Reggie Jackson and Andre Drummond with perimeter shooters, a la Dwight Howard in his Magic days. While Detroit already obtained Ersan Ilyasova from Milwaukee, they may want some more shooting at a cheap price. A likely deal would be Lamb, Jones, and No. 14 & 48 for Anthony Tolliver (who has a partially guaranteed contract) and No. 8. Detroit could use a wing defender and may be able to find one at 14. Conversely, Charlotte is another team in serious need of perimeter shooting. The Hornets finished with the worst 3-point shooting percentage in the league. Earlier in the offseason, they traded Lance Stephenson for Matt Barnes and Spencer Hawes. But if they can get more perimeter shooting, it may completely transform the dynamic of their team. A likely deal would be Lamb, Jones, Novak, and No. 14 for Gerald Henderson (1 year at $6 million) and No. 9. Edit: The Hornets traded Gerald Henderson and Noah Vonleh to the Portland Trailblazers for Nic Batum. And, according to Rick Bonnell of the Charlotte Observer, the Thunder traded Jeremy Lamb to the Hornets for Matt Barnes. So there goes that theory! So if the Thunder move, who do they take? One of the best two-way wings in the draft. Compares favorably to Jimmy Butler of the Chicago Bulls. Great size for a wing, and has shown the ability to score in a variety of ways (transition, 3-point shooting, shooting out of the pick and roll). Needs some seasoning. Struggles with finishing at the rim. Likely won’t contribute too much in rookie season. One of the best, if not the best, shooter in the draft. Shot over 40% from 3-point land on 3.7 attempts per game. Great from deep and from mid-range. Compares favorably to Eric Gordon of the New Orleans Pelicans. Good size for a wing. Youngest player in the draft. Not a high flyer or overly athletic. Extremely low steal rate. Likely won’t contribute too much in rookie season. Doubtful Super Mario falls to the No. 8 or 9 spot. But if he’s there and the Thunder have traded up, they may seriously consider drafting Hezonja. Gifted with a great jump shot, athleticism, and unabashed confidence, Hezonja plays a lot like the Thunder’s own Russell Westbrook. He has great size for a wing and has the potential to be good on the defensive end. Consistency is the biggest issue with Hezonja. He’s had games where he looks like the best player on the floor, and then he has games where he disappears for long stretches. There could be a possibility that the Thunder like a player they can draft at the 14th spot. The draft has a weird way of shaking out sometimes, and players that you thought wouldn’t be available at your spot, suddenly become available. Here are the prospects the Thunder could pick at their spot. GREAT size for a wing. Can likely develop into a good defensive player based on his physical attributes alone. Compares favorably to James Posey or Giannis Antetokounmpo. Shot the ball well from 3-point territory in his freshman year (36% on 2.6 attempts per game). Good mid-range game. Solid defensive rebounder from the wing, with an ability to keep balls alive on the offensive end. Strong, wiry frame that can easily add 10-15 lbs of muscle. Struggles with creating offensive (only 0.8 assists per game) and consistency. Likely won’t contribute immediately, and may benefit from some time in the D-League. Playmaking point guard that can score in a variety of ways. 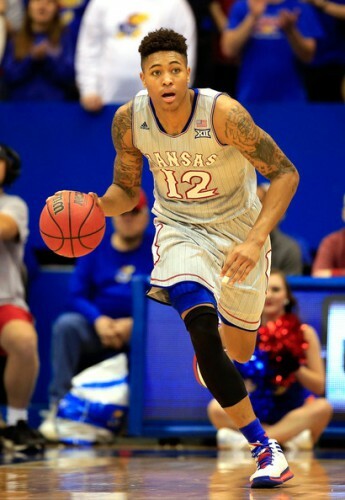 Compares favorably to Jeff Teague of the Atlanta Hawks. Has good size for a point guard with a wingspan that will help him immensely on the defensive end (nearly 2 steals per game in college). Does a great job of changing speeds to keep defenses off balance. Did a great job of balancing his playmaking and scoring, dishing out 6 assists per game, while scoring 20 points. Has a good, but not great shot. Needs to put on more weight. Struggles finishing at the rim, instead choosing to shoot floaters (nearly 3 per game,which led all college players). Small school competition stigma. A high energy player with a relentless motor, Portis reminds me of Draymond Green of the Golden State Warriors. The SEC Player of the Year led the Razorbacks in points (17.5) and rebounds (8.9) per game. He gets most of his points off his energy in transition and put backs. But he is a very skilled all-around player, shooting 53.6% from the field overall and 46.7% from 3-point territory on nearly one attempt per game. His major downfall is that he isn’t overly athletic. His game stays closer to the ground than most NBA scouts would like. He is actually my darkhorse for this pick. Dekker is an all-around talent that is good at most things, but not necessarily great at any specific skill. He has great role player potential and can play multiple position (naturally a 3, but can likely play small-ball 4 also). Defensively, Dekker can guard multiple positions. His size and strength allow him to guard bigger players, and his lateral quickness allows him to keep up with wings. He will likely be able to compete immediately on the pro level. He’ll need to hit his 3’s more consistently at the next level to be an elite contributor. May be a bit redundant for the Thunder if they re-sign Kyle Singler. Another possibility for the Thunder is to trade down later into the first round, while possibly picking up another asset. If the Thunder have a player in mind that they can possibly be taken lower than 14, they’ll likely look to move down. Remember, as you get deeper into the first round, the cost of the player goes down. And with the Thunder likely to be in the luxury tax, anything that can bring the price tag of the tax bill down will be a relief. Three-point specialist that shot only 30% from deep this past season, as defenses keyed in on him as the focal point of their attention. Compares favorably to Jeremy Lamb. He also averaged 3.5 assists which highlighted his playmaking ability. Good mid-range shooter. Can be a bit streaky as we saw in the Georgia State’s first game in the NCAA tournament against Baylor. His length allows him to be a menace on the defensive end, as he averaged 2.1 steals and 1 block per game. Body frame doesn’t seem like it can pack on too much more weight. Small school competition stigma. Combo playmaking guard that led Notre Dame in points (16.5) and assists (6.6). Compares favorably to former Thunder guard Reggie Jackson. Does a real good job of changing speeds and has a quick first step. Good upper body strength that allows him to get to the rim and score through contact. Good, not great, shooter. Solid defensively. Strength allows him to not be too affected by screens and his lateral quickness allows him to keep up with guards. Can take bad shots early in the shot clock. Can be a bit inconsistent at times. Will be 23 years of age at the beginning of the season. Likely ready to contribute right now, but does not have a ton of upside. One of the better wing defenders in the draft. Compares favorably to Tony Allen and Michael Kidd-Gilchrist. Length, strength, and athleticism give him the potential to be a top-flight perimeter defender in the league. Scores most of his points in transition and straight line drives to the basket. Rebounds well for his position, especially on the offensive end (2 offensive rebounds per game). Hollis-Jefferson’s biggest weakness is his jump-shot. He just under 21% from 3-point territory. With the Thunder already having an elite defender that struggles with his jumper (Andre Roberson), it may be a bit redundant to draft a similar player that will be a net negative on the offensive end. The Thunder have a ton of options in this draft. They could take one of these 10 players, or they could surprise everyone and draft a complete unknown (hello, Josh Huestis). Thunder GM has plenty of cards up his sleeves, and will pull the one he feels will make the Thunder a better team for next season and for seasons after that. The Oklahoma City Thunder have never been known to be big players at the trade deadline. In their 6 previous seasons in OKC, the Thunder rescinded one blockbuster deal (Tyson Chandler in 2009), used the pieces from the rescinded trade to salvage another one (Thabo Sefolosha in 2009), made another blockbuster deal in 2011 (Nenad Krstic and Jeff Green to Boston for Kendrick Perkins and Nate Robinson in 2011) and acquired Ronnie Brewer from the New York Knicks for a 2nd round pick in 2012. Talk about living dangerously with that last one! But this season seems different. The Thunder were already a part of a January mini-blockbuster trade that involved 3 teams, 4 players, and a first round pick that netted the Thunder Dion Waiters. And the Thunder still have enough assets to make another deal or two before Thursday’s trade deadline. First off, what assets do the Thunder have? The Untouchables – Kevin Durant, Russell Westbrook, Serge Ibaka, Steven Adams, Andre Roberson, Mitch McGary, Nick Collison, Anthony Morrow, and Dion Waiters. 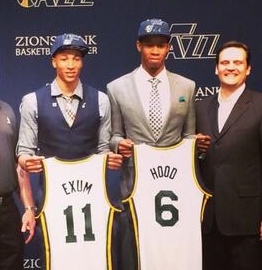 Filler – 2015 2nd round pick and the draft rights to Tibor Pleiss, Alex Abrines, Josh Huestis, and Semaj Christon. What do the Thunder need? Outside shooting – The Thunder’s 3-point shooting percentage is a paltry 32.5%, good for 25th in the league. That percentage also ranks the lowest (by about 4 spots) of any teams that is currently slated in a playoff spot (to include New Orleans). The Thunder make about 7.4 3-pointers per game, which is tied for 15th in the league and ranks them ahead of only New Orleans and Memphis for Western Conference teams that in the playoff race. If that shooter can also be a plus on the defensive end, then that’s even better. Interior scoring – The Thunder have never had a bona fide interior scorer. Someone they can dump the ball off to in the paint and know there’s a high percentage an easy shot will come out of it. The Thunder are tied with 2 other teams for 17th in the league in Point Per Shot (pps). What this means is that the Thunder are in the lower half of the league in getting easy baskets. Luxury tax relief – The Waiters trade pushed the Thunder about $2.2 million dollars over the luxury tax line. Luckily, the Thunder have never been over the tax line and are in no risk of having to pay any repeater tax. The Thunder may be willing to remain above the tax line this season, or they could just as easily went to get back under the tax line before the deadline is over with. This deal was already hinted at about three weeks ago. The Thunder appeared ready to make the deal, but the Nets hesitated, probably wanting to see if they could get a better deal. The Thunder get their interior presence (albeit an injury prone one with a player option for $16.7 million next season). Brooklyn gets what they are desperately coveting: luxury tax relief and an acceleration to rebuilding. The Nets are looking for a combination of expiring contracts, young players, and picks. But no one in the league is really looking to give up financial flexibility for a big man that is injury prone and due to make that much money next season. If the Thunder are looking for an offensive big man, Kanter may be a cheaper option than Brook Lopez. In addition, the Thunder get some luxury tax relief in the process. Utah gets a veteran big man with an expiring contract to mentor Gobert and Favors and a young wing that needs playing time to blossom. With Denver looking to build for the future, everyone on the team, save for Jusuf Nurkic and Gary Harris is likely on the table. OKC would love to get a 2-way wing that can either come off the bench, or immediately start if necessary. The Thunder have already experienced what happens in the playoffs when teams lay off their offensively challenged players and pack the paint. A long wing with the ability to knock down a jumper would be a great commodity to have moving forward. Denver would probably love to add Jackson to their young core. Jackson has been through playoff battles and appears eager to lead his own team. The Thunder get a more defensive minded back-up point guard with playoff experience that has knocked down big shots in the past. In addition they get a big that can give you something on the offensive end of the floor. Indiana gets a point guard that can, not only create for himself, but also create for others. In addition, they get a big with a $9 million dollar expiring contract. The luxury tax. Why pay if you don’t have to? Philadelphia is about $13 million dollars under the the salary cap floor. If they want to avoid pay it, they may be willing to take on a player or two. Stay put. Yeah, its an extremely boring option. But the Thunder, as currently constructed, are a championship contending team. Take away the injuries to the key players, and you have a team that would likely be in the thick of the Western Conference elite. They have a good mix of offense and defense, and only now appear to be putting it all together. Plus, Mitch McGary may be offensive big man the Thunder have been looking for. He’ll have his missteps in this his rookie season. But the kid oozes potential and brings a completely different dynamic to the team. It’ll be a crazy 24-48 hours from here on out. It could be a roller coaster or it could be a drive to the local Wal-Mart. Just make sure you buckle up. It’s been 4 out of 5 games. Against some of the worst teams in the league. But they have been victories, and they have been needed. The Thunder can’t be picky from here on out about how or against whom they get their wins. They just have to get them…and by the bunches, if possible. Their past game and this game are bit of a redemption tour for the Thunder. And that’s basically what the rest of this season is going to be. The necessity of making up for the lost first month of the season will be the theme of the season. Fortunately, for the first time all season, the Thunder have been healthy for some games now, and appear to be hitting their stride. This is the 2nd meeting of the season between these two teams. In the first game, the Bucks used a strong second quarter to wrestle the game from the Thunder, and kept them at bay in the 2nd half to win 85-78. The Bucks come into this game with a surprising 11-11 record, but have lost 4 out of their last 5 games. They have feasted on the weak teams in the league, to include Oklahoma City when they were the walking wounded. Against teams with a record of .500 or higher, Milwaukee is only 1-8 this season. They are middle of the road in most statistical categories, and are just now learning how to compete in the league. Point guard Brandon Knight seems to be coming into his own, after struggling to find his way in Detroit and in his first season with Milwaukee last year. He leads the team in points (17.6), assists (5.8), and steals (1.5), and has been surprisingly efficient. 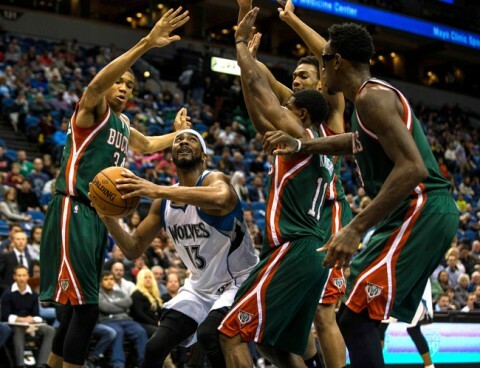 On the wings, OJ Mayo and Giannis Antetokounmpo provide a contrast of styles that can make them difficult to defend. Mayo is the perimeter player who can be streaky at times, while Antetokounmpo is the genetic freak that is just now learning how to use his physical tools. Rookie Jabari Parker has seen his averages steadily improve as the season has progressed. Up front, Larry Sanders has kept himself out of trouble and is giving the Bucks what they expected of him, which is defense and rebounding. The Bucks have one of the more deeper benches in the league, and it is not uncommon for them to regularly go 11 or 12 deep in a game. It features a mix of young and old, with veterans like Jerryd Bayless, Jared Dudley, Ersan Ilyasova, and Zaza Pachulia, and young players like Khris Middleton and Kendall Marshall all getting significant playing time. 1. 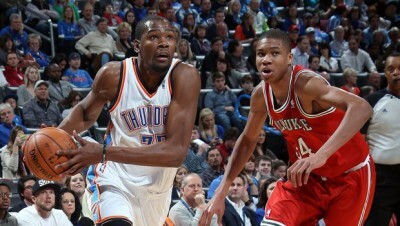 Kevin Durant vs. Giannis Antetokounmpo – Freak vs. Freak. If you were to go into some Cold War-aged, unethical, secluded laboratory located somewhere in a bunker east of the Balkans that allowed experimentation on humans and were told to create the perfect basketball player, you’d probably create something along the lines of Durant and Antetokounmpo (but with a little bit more muscle mass, of course). Two 6’10-ish guys that can move gracefully and handle the ball well enough to be considered guards. 2. Serge Ibaka vs. Jabari Parker – Parker is currently undersized for the position, but he is probably versatile enough to give Ibaka problems on the perimeter. While Ibaka may have the edge in the rebounding department, Parker’s ability to float around the perimeter will likely negate Ibaka’s best strength, which is as a rim protector. 3. Kendrick Perkins vs. Zaza Pachulia – Silver back vs. Gümüs geri (silver back in Georgian). Perkins has been pretty successful in his transition to the bench. We’ll see how he handles the king of the back-up bigs in Pachulia. 1. Rebounding – The Bucks are 3rd in the league in terms of offensive boards (11.5/game), while at the same time, giving up about the same amount of offensive boards away (11.4/game). Which ever team puts their stamp on the board, will likely win this game. 2. Bench – When the Bucks and Thunder first met, Milwaukee sported one of the best scoring benches in the league. 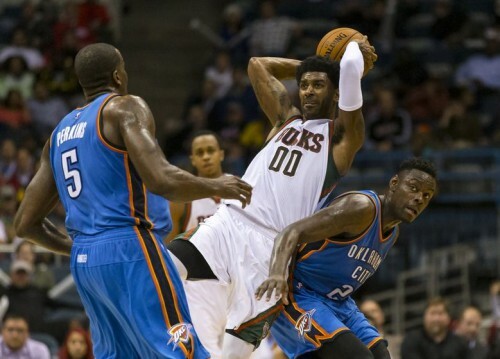 And it showed as the Bucks bench outscored the Thunder bench 53-22 in the first meeting. Since then, though, Mayo and Antetokounmpo have moved into the starting line-up and Ilyasova and John Henson are both out with injuries. 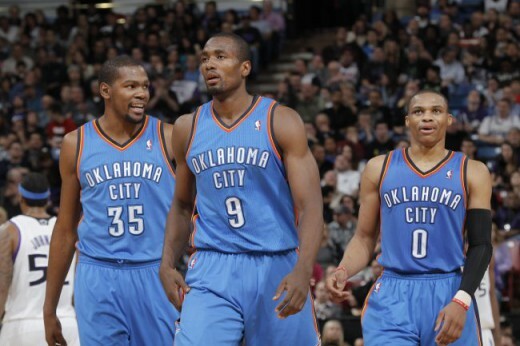 Conversely, the Thunder now sport a fully healthy team. That, combined with Jeremy Lamb’s recent resurgence, likely means the Thunder will take advantage of their off the bench. 3. Durant and Westbrook – This is their first game in Oklahoma City as a healthy duo. Hopefully, a little home cooking will be the catalyst the team needs to get into the right groove. To call this season eventful would be an understatement. The Oklahoma City Thunder currently sit at 3-10, a far cry from the record many predicted the Thunder would have at this point before the season started. But those predictions are usually predicated on the belief that injuries won’t be a factor. Well, injuries have been a huge factor for the Thunder. Here are 10 thoughts from the first two weeks of the season. It started with a small blurb, “Mitch McGary’s foot will be re-evaluated following the (Denver) game.” This was right after the Thunder’s first preseason game. A game in which McGary looked like the second coming of Bill Laimbeer. The injury occurred late in the game, but McGary stayed in the game until the final buzzer. But alas, McGary ended up with a broken foot and was reported to be out for 6-8 weeks. Then, after the second preseason game, Kevin Durant went to the training staff to complain about foot pain. It was revealed that he had suffered a Jones fracture and would need surgery. His recovery was slated to take 6-8 weeks also. Next up was Anthony Morrow, who was injured in practice two weeks before the start of the season. He recovery period was said to be between 4-6 weeks. Then 2 days before the start of the season, Reggie Jackson (ankle) and Jeremy Lamb (back) both got injured in the final home practice of the preseason. The Thunder started the season with 8 healthy bodies. Then in the second game of the season, Russell Westbrook missed a shot, went up for a rebound, and came down looking at his hand. He accidentally slammed is hand against Kendrick Perkins’ granite elbow and ended up with a broken bone in his hand that required surgery. His recovery period is said to be between 4-6 weeks. Down to 7 healthy bodies. Reggie Jackson came back for the 4th game of the season, but in that game, Andre Roberson went down with a sprained foot. Down to 6 healthy bodies. 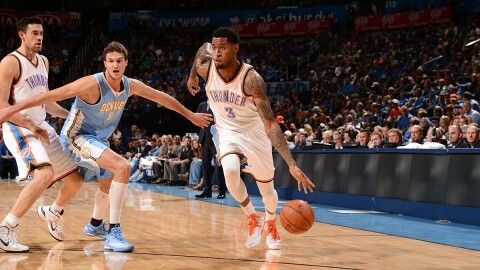 In the 5th game of the season, the Thunder got Lamb back, but lost Perry Jones due to a knee contusion. One step forward, one step back. Luckily, the Thunder haven’t suffered anymore injuries since then. The cavalry is due to come back in the next few weeks, with the hope being that the patchwork Thunder can stay afloat long enough for the team to dig out of the injury-riddled hole it’s gotten itself into. To get a full grasp of the current injury situation, Thunder players have already missed 80 games due to injury through 13 games. Thunder players missed 83 games due to injury all of last season. I’ve never seen an injury spell like this, but it does kind of remind me of the 2nd season the Hornets were in town. In that season, the Hornets were predicted to be on the verge of a playoff spot in the Western Conference. They had a young, up-and-coming duo in Chris Paul and David West, a young defensive big man in Tyson Chandler, and the catch of the offseason in Peja Stojakovic. The season got off to a great start as the Hornets opened up 8-3 out of the gate. But then came the injuries. Top reserve guard Bobby Jackson missed 26 games due to a cracked rib, West got injured in the 8th game of the season with an elbow issue that required surgery and missed 30 games, Stojakovic had back surgery after the 13th game of the season and missed the rest of the year, and Paul severely sprained his ankle in the 27th game of the season and missed the next 17 games. The Hornets still battled throughout the season, but the injuries proved to be too much and they were eliminated from the playoff hunt in the final month of the season. Here’s hoping the Thunder fare a little bit better. This could simultaneously be the best and worst thing for the Thunder in their future negotiations with Jackson. It’s great because the Thunder have a third player they can lean on if Durant and Westbrook either miss time or are being heavily keyed on by the opposing defense. And with this injury bug, they’ve definitely needed Jackson to step up. But it’s bad because, with every good game Jackson has and with every game he takes over in the 4th quarter, it’s just a little bit more added to his asking price. Through his first 6 games of the season, Jackson is averaging 22.8 points, 7.5 assists, 4.0 rebounds, and 0.7 steals on 43% shooting from the field. Removing sample size from the equation, those numbers look very Westbrookian. But like everything else in the NBA, once opposing defenses get at least 5 games worth of film on you, they can start to scheme against your strengths. In the last 4 games, opposing teams have begun to focus their defensive energy on Jackson. They either blitz him with an additional defender when he’s 23 feet from the basket or they shadow him with a big man as he dribbles on the perimeter. In those 4 games, Jackson is averaging 15.3 points, 8 assists, and 6.3 rebounds per game. Those are still good number, but his shooting percentage in those 4 games has dropped to 34.4% overall and 20% from 3-point territory. Without too many consistent options on the offensive side of the ball, Jackson is getting a glimpse of what life could like on his own team. The dirty little secret with the Thunder is that with Westbrook and Durant on the floor, their exorbitant usage percentages tend to mask the full talents of their 3rd and 4th best players. James Harden was never given the opportunity to fully show his array of skills throughout his time with the Thunder. Yes, he played well enough to win the 6th Man of the Year award, but it wasn’t until he was fully unleashed while on the Rockets that he proved he was, arguably, the best 2-guard in the game. While Jackson will likely never be in the discussion for best point guard in the game, he definitely has the skill set to be considered in that second to third tier of point guards outside of Chris Paul, Tony Parker, Steph Curry, and Westbrook. If I’m a young player in the NBA and I know that I’m likely headed down the career path of being a role player/specialist, then I would be attaching myself to the hip pockets of any of these two guys. In the midst of all this chaos, Collison and Perkins have been bastions of stability, with surprising flashes of necessary greatness. Perkins could have come into this season moping and complaining because of his demotion to the bench. Instead, he’s approached this season with an almost youthful zeal, and he’s probably put together the best 9 games of his Thunder career. In the Thunder’s first win of the season against Denver, Perkins (after scoring 17 points, by the way) echoed the sentiments of the coaching staff by saying that the Thunder “were all in this boat, together.” These are the intangibles that can’t be measured by a statistician. For the most part, Perkins’ stat do not merit his $9.4 million dollar salary. But as a locker room leader, its times like this where Perkins earns every penny he receives in that pay period. Collison’s play for the past season and a half would lead most to believe that he was on the last leg of his career. The nagging injuries were starting to mount and his effectiveness on the court was starting to diminish. But the saying, “You can’t teach an old dog new tricks,” fell on deaf ears when it came to Collison. Over the offseason, Collison worked on refining his outside shot. There were glimpses of it last season, but this year, Collison has taken it to another level. He has made more 3-point FG’s in the first 13 games of the season (11), than he has in the first 10 years of his career (5). While this may be some sort of statistical anomaly, it may also be the renaissance that can extend Collison’s effectiveness a couple more seasons. In the 7 seasons the Thunder have been in Oklahoma City, they’ve had a number of 3-point specialists on the team. From Daequan Cook to Kevin Martin to Anthony Morrow, the team is always in search of players that will help spread the floor and provide Durant and Westbrook space to operate. The floor spacer the team has been looking for may have been on the team all along. 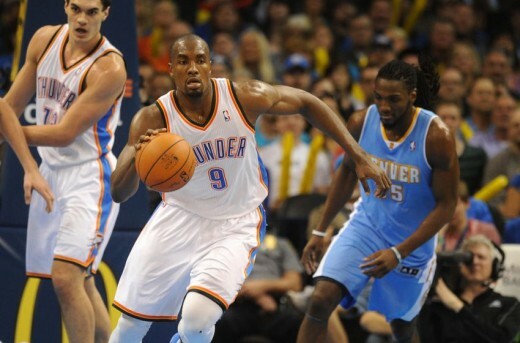 Serge Ibaka had shown signs of being an effective 3-point shooter in the past couple seasons. In the last 2 seasons, Ibaka has shot 43-117 from 3-point territory, good for 36.8%. This season, through the first 13 games, Ibaka is 23-59 (39%) from deep on 4.5 3-point attempts per game. He has already matched his total of made 3-point FG’s from last season. Some of that is out of necessity due to the team needing to find offense in its current situation. But, I also think this may be by design. Can you imagine Durant, Westbrook, and Jackson operating in a small ball line-up where Ibaka takes the center out towards the 3-point line? I would surmise it would be almost unfair. More than any other sport, athleticism is of extreme importance to basketball. The fluid nature of the game, the constant movement, the jumping, the slashing, the running. It’s almost like a fast paced ballet. The more athletic the player, the more of a leg up they have in the league. Is every athletic player destined for greatness? Of course not. But athleticism can be a major tool to have in an NBA career. For two years now, we’ve heard from different members of the Thunder organization marveling about Jones’ athletic ability. Heaping the accolades that he is the most athletic player on an extremely athletic team. But on the court, he could never seem to put it all together. You saw the flashes of athletic brilliance, but the motor and the want to be great seemed to be missing. What you got was a player that was seemingly content with being a “utility defender” and a spot-up 3-point shooter. With necessity, though, comes action. When Westbrook went down in the first half of the 2nd game of the season, the Thunder were left without a consistent playmaker. Sebastian Telfair, a player that wasn’t even in the league last season, was tasked with setting up the offense. But who would he pass it to? Enter Perry Jones. With the vacuum created by the absence of Durant, Jackson, and Westbrook, Jones stepped up and averaged 22.7 points, 5 rebounds, and 2 assists on 52% shooting from the field in the 3 games in which he played more than 34 minutes. Even though it was only a 3 game spurt, the experience Jones got in learning how to use his tools, may be key to the Thunder’s future success. The first two games after Lamb came from injury: 17 points, 6 rebounds, and 2 assists per game on 46.4% FG shooting and 33.3% from 3-point territory. The next two games from Lamb: 5 points, 4.5 rebounds, and 2 assists per game on 17.4% FG shooting and 0-7 from 3-point territory. So, what was the difference between these two splits? The easy answer is that the first two games were at home and the next two were on the road. But I think the real cause goes deeper than that. Last season, Lamb’s home/road splits were nearly identical. Consistency, based on venue, was never an issue with Lamb. So, then, what was the major difference between the first two games and the next two games? My hypothesis is that Lamb performs better when there is no competitive pressure on him from an internal source. In essence, when he is allowed to play carefree without anybody waiting in the wing to take his minutes, he performs wonderfully. But as soon as there is competitive pressure from a teammate for minutes, Lamb starts to press and his performance suffers. In the first two games that Lamb played, Anthony Morrow was out with a knee injury. But as soon as Morrow was activated, Lamb’s numbers suffered. A similar scenario happened last season when the Thunder signed Caron Butler in late February. Lamb’s performance, which had been trending downward in the month of February, completely bottomed out after Butler was signed and he lost his spot in the rotation. Since his first 4 games of the seasons, it appears that Lamb’s inconsistencies have a lot to do with home/road splits this season. At home, Lamb averages 15.8 points and 6.5 rebounds per game on 50% shooting from the field and 40% from 3. On the road, Lamb’s averages drop to 9.3 points and 3.8 rebounds per game on 25.6% shooting from the first and 27.8% from 3. Every year, the Thunder brings in about 3-4 hopefuls to training camp to fill out their preseason roster. Those players are usually cut by the time the season starts and some even become part of the Thunder’s D-League team. The Thunder like to head into the season with an empty roster spot in case they need to facilitate a trade or if they need to sign someone later in the season. But this season, with all the injuries, the Thunder chose to sign one of their training camp hopefuls. Lance Thomas beat out Talib Zanna, Richard Solomon, and Michael Jenkins to secure the coveted 15th spot on the team. A 15th man is usually a player that goes hard in practice, and then cheers from the sidelines in a nicely tailored suit as an inactive player. If the 15th man is getting playing time, then a couple of scenarios are at play: either several players on the roster are injured, a recent trade has trimmed the roster by at least 2 players, or some players are sitting out for rest. To us fans, the last guy off the bench is usually an afterthought. Someone we know is a part of the team, but also, someone whom we don’t necessarily want playing significant minutes. But to a general manager, the 15th man could be the piece of gum that prevents the dam from breaking. If the 15th man has to play, then he better be someone that can give you something of significance. Well, not only has Lance Thomas had to play, but he’s also started 9 games for the Thunder. He’s averaging career highs in points, rebounds, assists, steals, and turnovers. There are games where he plays like the 15th man on our roster. But then there are games where his energy and hustle help the team significantly. In a perfect world, I would love for Thomas to remain as our 15th man. In the real world, though, he will probably be the sacrificial lamb sometime this season, for a trade or to make room for a late season veteran signing. Whatever happens, he has shown his mettle and will likely get another chance in this league because of it. 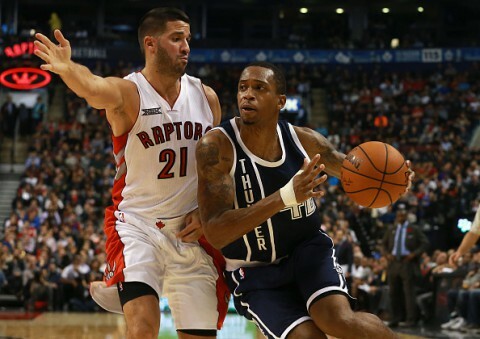 When Telfair signed with the team this offseason, the thought was that he would play the veteran third string point guard role that Royal Ivey and Kevin Ollie have filled in the past. A veteran that can still play some, but is more of a team-first guy. Instead, with all the injuries on the team, Telfair has had to fill the Derek Fisher role: point guard gunner off the bench. Telfair career was thought to be on its last leg after he played in China last season. For the promise that he brought coming into the NBA, he has been a bit of a bust. But he has carved out a respectable 10 year career as a journeyman playing for 8 franchises, including a two time tour of duty in Minnesota. As a third string point guard making the league minimum, Telfair would’ve probably fared great on this team. The scary part would’ve been if he was needed to be pressed into action, and that fear came to fruition as the season started. Surprisingly, though, Telfair has been a bit of a stabilizer on this team. Does he chuck too much at times? Yes. Does he turn it over more times than a veteran point guard should? Yes. Is he lacking defensively? Yes. But he’s a gamer when he’s in there and gives 100% effort. When Westbrook and Jackson were out for that game and a half in the beginning of the season, Telfair went out there and performed admirably against Chris Paul and Ty Lawson. His veteran presence has helped this team stay even-keeled throughout this arduous process. The Coach of the Year award usually goes to one of two coaches: either the coach on the team that overachieves and makes the playoffs or the coach on the best team in the league when there isn’t a surprise overachieving team. But let’s say the Thunder navigate through this rough start and actually make it to the playoffs in the Western Conference. Wouldn’t Brooks be as deserving in leading this patchwork MASH unit to the playoffs as any other coach in the league? Brooks has had to adapt to the team he has. He’s muddied up the games in hopes that the Thunder can stick around long enough to make a run at the end of the game. He’s employed 2-3 zone defenses and strange line-ups where every player on the floor was over 6’9″ (Jones, Thomas, Perkins, Ibaka, and Collison). He’s become kind of a subdued mad scientist. Will voters remember this run when Westbrook and Durant have played 55-60 together at the end of the season? Probably not. But the biggest knock on Brooks has always been is inability to quickly adapt to situations, whether in game or in a small sample size of games. Now that he’s adapting on the fly, I wonder if this will continue when the reinforcements come back, or if Brooks will revert back to his old ways. Either way, if the Thunder are anywhere near the 6th seed in the West when the season closes, I think Brooks should be in consideration for COY. 10. Heart of a Champion! Regardless of where the Thunder finish this season, the moxie they have exhibited in these first 13 games should be applauded. Have they looked horrible at times? Yes. But, at least they haven’t looked Philadelphia 76ers horrible. They’ve been in most games until the end and have shown no quit. It’s been a learning process and hopefully, the lessons learned early this season will help guide this team in May and June. The last time the panic alarm was this loud in Thunder Nation was after the 2nd game of the season. The Thunder had just lost 2 close games on the road, and to top it off, they lost their All-Star point guard to a broken hand. The roster was down to 8 healthy players, none of which had ever been tasked with leading a team to battle. The Thunder needed a respite and they needed it fast. Enter the Denver Nuggets. The Thunder got off to a big lead and still had the fortitude to win a close game when Denver got hot in the 4th quarter. From there, the panic dampened as the Thunder started getting some players back from injury and actually won a couple more games. But with the Thunder staring at a 3-9 record, the offense struggling, and their superstar duo probably not coming back for at least another 2 weeks, the panic alarm is once again wailing. The Nuggets come into the game with a 3-7 record. They won their first game, and then proceeded to lose their next 6, before finally winning the last 2 of 3, including a road victory in Cleveland in their last game. The Nuggets are middle of the pack when it comes to scoring (101.5 ppg), but give up the 4th most points in the league (107.1 ppg). Their rebounding is one of their strengths and it fuels their transition game. Ty Lawson is one of the better pace pushers in the league, using his speed to beat defenders up the court and causing havoc in the paint. On the perimeter, Arron Afflalo and Wilson Chandler have had their troubles being consistent. Up front, the big man rotation of Kenneth Faried, Timofey Mozgov, and JJ Hickson provides plenty of energy in going after rebounds and hustling defensively. 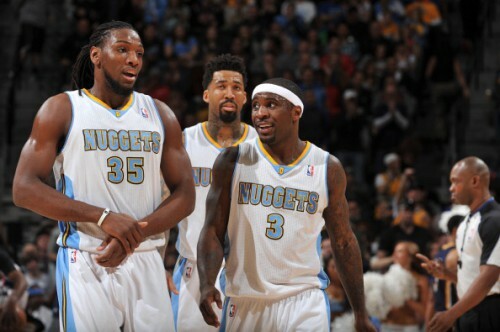 The Nuggets are one of the deepest teams in the league, usually going at least 12 deeep into the rotation. The bench players that receive most time are Randy Foye, Danilo Gallinari, JaVale McGee, Alonzo Gee, and Nate Robinson. 1. Consistency – The Thunder have held leads in the last few games they have lost. Sometimes those leads even balloned up into the double digits. 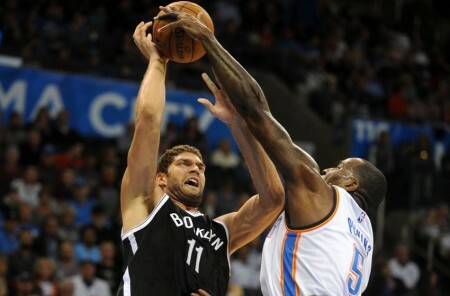 But the Thunder have failed to capitalize on those leads due to a stagnant offense. When the Thunder play their best is when they are passing and moving. As soon as the offense becomes iso-oriented, the Thunder struggle due to having their iso MVPs on the bench in street clothes. The Thunder can’t stop playing their current brand of basketball as soon as they see a little light at the end of the tunnel. They aren’t good enough to go off the cuff. They need to stick to their script. 2. Rebounding – I feel like I’ve written this in the last few pre-game reports as a key to the game, but the proof is in the pudding. In their last 3 games (all losses), the Thunder have been outrebounded by an average of 11 rebounds and have allowed the opponent to grab an average of 16 offensive rebounds. While I like the new found perimeter aggressiveness of Nick Collison and Serge Ibaka, I feel like them being so far from the basket takes away from their opportunities to grab offensive rebounds. On the defensive end, Steven Adams needs to play bigger and occupy more space to grab more defensive boards. 3. Reggie Jackson – The offense goes as he does. If he is masterfully setting up his teammates and controlling the flow of the game, the Thunder usually are usually in control and rolling. As soon as he goes off script, the Thunder tend to struggle. I don’t necessarily fault Jackson. This is his first foray as the focal point of the offense, and he is still adjusting to being shadowed by at least one other defender. At the beginning of the season, you would’ve needed an alternate universe to imagine a scenario where the Utah Jazz would have a better record than the Oklahoma City Thunder through 11 games. But, alas, through a series of unfortunate events, here we stand today. The Thunder are battling and doing whatever necessary to stay in games. Whether it’s muddying up the game or getting hot at the right time, the Thunder have been competitive in every game this season, sans one. Unfortunately, staying in the game is completely different than actually winning the game. And that is where the Thunder are struggling right now. If coffee is for closers, then the only one on the team even sniffing a Starbucks gift card is Reggie Jackson. The Thunder have to start finding a way to finish out these close games. This is the first of 4 meetings between these Northwest Division opponents. The Thunder won 3 of 4 meetings with the Jazz last season, winning by an average of 18.3 points. Also, not that it means much, but the Thunder defeated the Jazz 88-82 in the preseason. The Jazz come into the game with a 4-7 record. They rank in the bottom third of the league in points scored, points allowed, rebounds, and defensive rating. Surprisingly, though, they rank in the top ten in offensive rating. The Jazz are in the second phase of their rebuild. A lot of their young players from the past few seasons are either coming up on extension or have already signed their first extension. At this point, improvements and jumps will probably be expected. 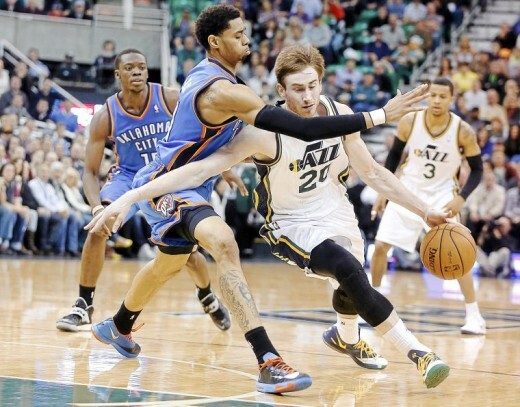 Point guard Trey Burke leads the Jazz’s attack. While still young, Burke has shown a knack for breaking down defenses and causing havoc in the lane. His backcourt mate, Alec Burks has started to show the consistency that has been missing in his first 3 seasons. Gordon Hayward, who signed a max deal this offseason, is settling into his role as the leader of the team. Averaging 19.5 points, 5.5 rebounds, 4.8 assists, and 1.3 steals per game, Hayward is quickly becoming one of the better all around players in the game. Up front, Derrick Favors and Enes Kanter provide the Jazz with a big, mobile front line they hope will one day mimic the front line of Memphis. Off the bench, the Jazz play the rookie trio (Dante Exum, Rodney Hood, and Joe Ingles), along with Rudy Gobert and Trevor Booker. 1. Control the boards – The Jazz are a lot like the Detroit Pistons in that they aren’t very efficient at shooting, but have the necessary bigs to grab offensive boards. Kanter, Favors, and Gobert are extremely active up front, and can gobble up rebounds if given the opportunity. 2. Turnovers and Transition – The Jazz play at the second slowest pace in the league and try to limit their turnovers. But with such a young roster, they still average about 14 per game. If the Thunder can force a few more turnovers and get the Jazz running, they may exploit a style of play the Jazz aren’t comfortable with. 3. 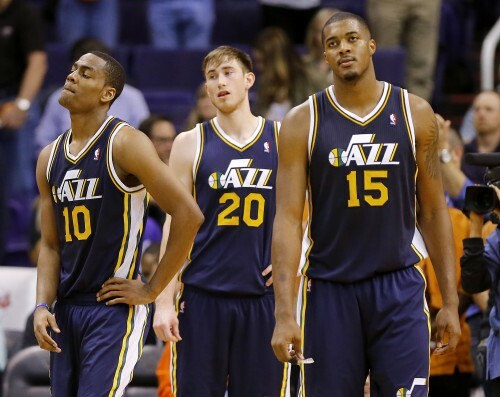 Take advantage of the rookies – The Jazz play their three rookies at least 15 minutes a game. If the Thunder want to take advantage of the experience factor, this would be the time to impose their will. 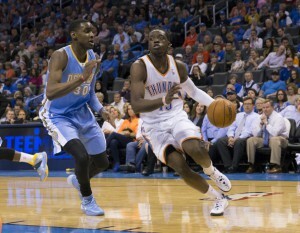 The Oklahoma City Thunder come into Friday night’s match-up against the Memphis Grizzlies at 1-4. A far cry from the number 2 seeded team they were in the playoffs last season. Don’t let the record fool you, though. Yes, injuries have bitten the team hard, but in that stead, a champion’s heart has started to emerge. Even though the team has fluctuated between 7-8 healthy players, the Thunder have been in every game heading into the 4th quarter except one. That is a testament to the players’ wills and to the coaching staff for having the team prepared. With that said, the season stops for no team and continues on. The Thunder vs. Grizzlies match-up is a rivalry that has been building for the past few seasons. Both teams started their ascension to the top of the Western Conference around the same team, with the Thunder having gone a little bit further in that time span. Last season, the Thunder won the season series 3-1, but nearly got ousted by the Grizzlies in the first round. That playoff match-up was one for the ages with Games 2-5 being decided in overtime. The series featured game-saving 4-point plays, epic 4th quarter comebacks, super-nova’ed bench players, and Perkins hitting a game-tying put back to send one of the games to overtime. 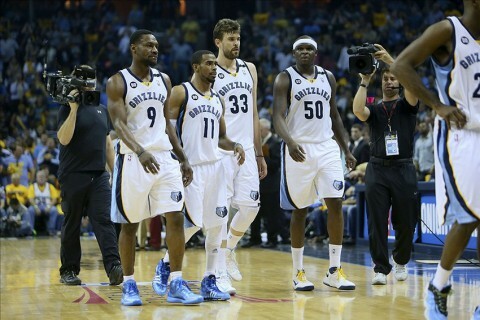 The Grizzlies come into the game with a 5-0 record, boasting the best defense in the league. They allow a league low 86.2 points per game and are 2nd in Defensive Rating. The offense, while not high scoring, is one of the better half-court offenses in the league. Mike Conley continues to play his part as “most underrated point guard in the league.” With per game averages of 15.4 points, 6.6 assists, and 1.4 steals, Conley continues to be one of the most consistent point guards in the league. Up front, Zach Randolph and Marc Gasol make up one of the most formidable front court duos in the league. Their size and skill in the post creates problems for most teams. On the wing, Courtney Lee is currently shooting an unsustainable 70% from 3-point territory and Tony Allen is one of the best perimeter defenders in the league (just ask Kevin Durant). The Grizzlies’ bench is veteran-laden, featuring Vince Carter, Quincy Pondexter, Kosta Koufos, and Beno Udrih. 1. Pace – The Grizzlies play at one of the slower paces in the league. They take their time, look for efficient shots, and keep turnovers to a minimum. Although the Thunder don’t have the horses to run like they normally would, a quicker pace may be advantageous to them in this game. 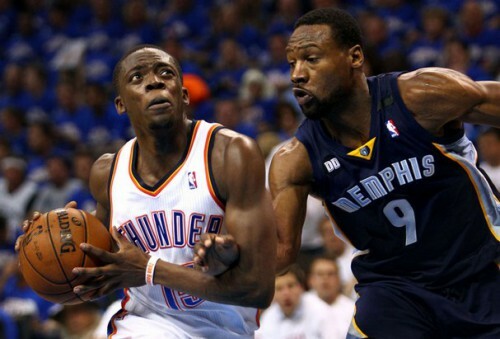 If the Thunder play at the Grizzlies’ pace, they may play into the opponent’s hands (paws?). 2. Perimeter shooting big men – The Grizzlies love to pack the paint and dare you to shoot jumpers. Their anchor on the interior is Gasol, the 2012-13 NBA Defensive Player of the Year. But a line-up with any two of Serge Ibaka, Lance Thomas, or Nick Collison, who can do damage from the perimeter, could take Gasol and Randolph out of the comfort zone of the interior and open up driving lanes for Reggie Jackson, Jeremy Lamb, and Sebastian Telfair. 3. 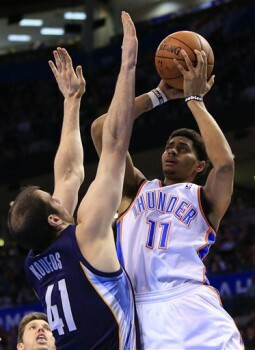 Jeremy Lamb – This will likely be Lamb’s first game of the season. It will be interesting to see how Lamb reacts, not only to being one of the primary offensive options on the team, but also to having no restrictions or pressure on him. 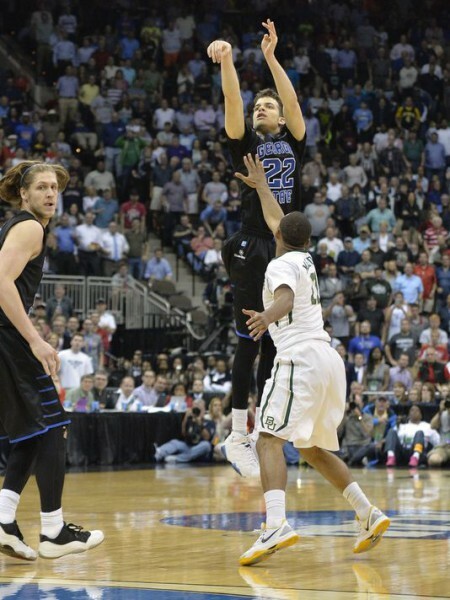 Even if he shoots awful, there is no one behind him in the depth chart to take his place. 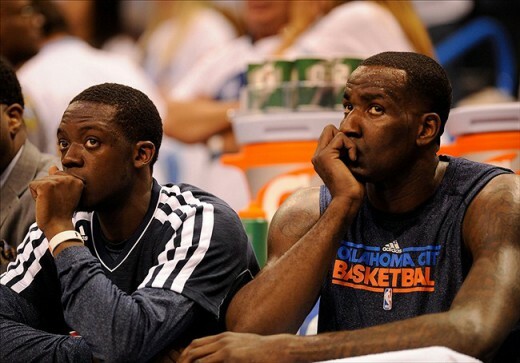 The beginning of the Oklahoma City Thunder’s 2014-15 campaign has been pretty dark. With injury after injury after injury, it feels like we’ve angered the God of Moses and have been cursed 7 times over. In fact, seven has been the consistent number of Thunder players on the injured list at any given time. Reggie Jackson comes back, but Andre Roberson gets injured in the same game and replaces Jackson on the injured list. Again, still seven. 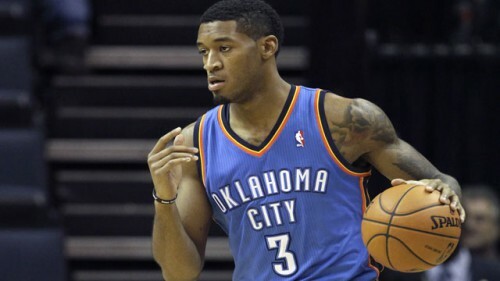 Then Perry Jones gets injured in the next, bringing the number of Thunder wounded to eight. After a day off yesterday, today provided a plethora of encouraging news from the Thunder practice facility. First of all, no one suffered any new injuries (whew!). Secondly, guys are starting to come back from their injuries. Here are a couple tweets from Royce Young of DailyThunder.com and Darnell Mayberry and Anthony Slater of the Daily Oklahoman. Perry Jones and Andre Roberson did not practice. Scott Brooks says Lamb practiced today and possibly can play tomorrow. Morrow practiced as well. Also hasn't been ruled out for Friday. 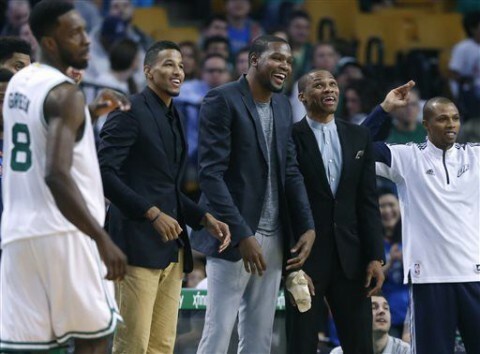 Kevin Durant is now walking without his walking boot. My best guess after today: Thunder will have nine guys Friday — Jackson, Telfair, Smith, Lamb, Thomas, Ibaka, Collison, Adams and Perk. Anthony Morrow participated in portions of practice, too. Getting closer, unlikely (but not ruled out) of tomorrow's game. Jeremy Lamb practiced fully today. Game-time decision tomorrow. Jeremy Lamb looks like the closest of any of the injured players to returning. Going through solid workout, full sweat. Jeremy Lamb, Anthony Morrow and Andre Roberson all shooting around after practice. Morrow with a knee brace. Another good sign. Kevin Durant walking around the Thunder practice court with a limp, but no walking boot. Progress. Jeremy Lamb practiced today and could play tomorrow against Memphis. Anthony Morrow participated some and is close. Mitch McGary also has his walking boot off. Limping around, but getting closer. Kevin Durant appears to have his walking cast off. He's strolling around with shoes on. So to recap: Kevin Durant and Mitch McGary are both out of their walking boots. Jeremy Lamb practiced hard and will probably be available for Friday’s game. Anthony Morrow and Andre Roberson shot around, but were limited. And there was no report on Perry Jones, who is likely out for Friday’s game. Also, the Thunder signed PG Ish Smith as their hardship exception signing. It’s faint, but there is a growing light at the end of this injury tunnel. Hopefully, that light gets bigger and bigger with each passing day. I have a confession: I’m completely geeked out for this new Avengers movie after watching the leaked (and then official) trailer. I’ve never been a big comic book fan. I always have to ask brother in law (an avid comic book fan) or Wikipedia about the back stories and B-level characters. But as the Marvel universe has progressed and expanded, it has slowly engulfed my interests and now I’m hooked. So, about that trailer. In it, the Avengers reassemble against a new foe, Ultron. Apparently, Ultron is a robotic creation of Tony Starks’ that either develops its own free will or is “infused” with its own free will. Anyways, like many other movies of the “robotic element with artificial intelligence” genre, Ultron decides that humans are inferior and must be eliminated. His opening soliloquy, voiced dead on by an eerie James Spader, ultimately locks into Ultron’s theme in the movie: “You want to protect the world, but you don’t want to change it. You’re all puppets, tangled in strings.” His closing line, cloaked behind an haunting rendition of Pinocchio’s “I’ve got no strings” song, tells the story of Ultron’s existence: “I’m free. I have no strings on me”. In a lot of ways, the young players on the Thunder have been held back by the strings of the current system they have in place. A system that caters mainly to the skill sets of Kevin Durant and Russell Westbrook (and to a lesser extent Reggie Jackson). The system is in place for good reason, though: notably that Durant and Westbrook, regardless of what ESPN’s NBARank thinks, are 2 of the top 5 players in the league. Players like Jeremy Lamb, Andre Roberson, Perry Jones, and Steven Adams all have specific roles to fill in the system. Any deviation from their role can threaten, not only the system, but also the player’s inclusion into the system (a.k.a playing time). Young players drafted onto championship contenders have the ominous distinction of not only having to develop, but having to develop specifically to a role. If young players are drafted onto bad teams, they are basically given free reign to develop into what they may ultimately become. It’s the tabula rasa concept of letting a blank slate paint itself. Carmelo Anthony’s career would probably be a lot different if he was drafted by the championship contending Detroit Pistons in 2003. In Denver, he was allowed to assume the leadership role of the team early on and develop on his own. In Detroit, he would’ve been stashed behind Tayshaun Prince and Rasheed Wallace for at least one season, if not longer. The young players on the Thunder have had to sacrifice their development for the greater good of the team. While they do get to develop in a winning environment, they unfortunately cannot get those 1-3 years of “tabula rasa” development back. The D-League helps, but the competition pales in comparison to the NBA. This season, from the outset, has been one of those “worst possible scenarios” type seasons. A lot of times when NBA writers are typing up their league preview columns, they sometimes give the Best Outcome/Worst Outcome for each team. Well, the beginning of this season has definitely been the “worst outcome” incarnate. It started with rookie Mitch McGary breaking his foot after the first preseason game. Then Durant was found to also have a broken foot that required surgery two days later. 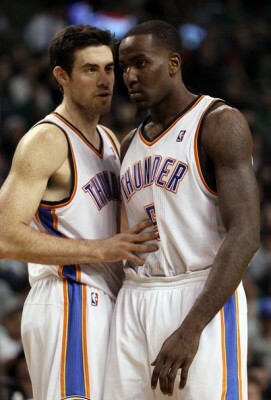 All the while, Serge Ibaka, Kendrick Perkins, and Nick Collison were out with various ailments. Then, a week before the season starts, Anthony Morrow goes down with a sprained MCL in pratice. Then two days before the start of the regular season, both Reggie Jackson (ankle) and Jeremy Lamb (back) get injured in practice and have to sit out the first two games of the season. And finally, Westbrook breaks his hand in the 2nd game of the season. It’s been a curse-like run of bad luck from the get-go this season. With struggle, comes change. 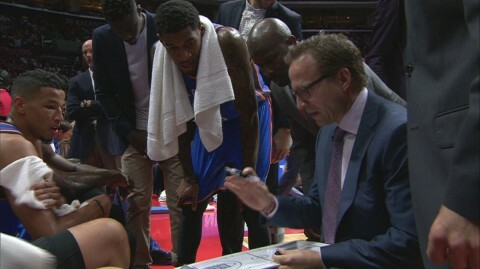 Coach Scott Brooks, long criticized for his inability to adapt on the fly to in-game situations, has had to almost free-style rap a system that is more suited to the likes of Reggie Jackson, Perry Jones, Sebastian Telfair, and Serge Ibaka. Gone is the system that was catered to two superstars. Now, the the strings of that system have been cut, and players like Jones and Roberson are able to explore and see what they can do in this league without any restraints. The Thunder have gone from championship contender to blank slate developers in the span of a month. With Jones’ career high 32 point explosion on Friday night, it proved , under the guise of necessity and when given a chance, these young players can achieve great things in this league. 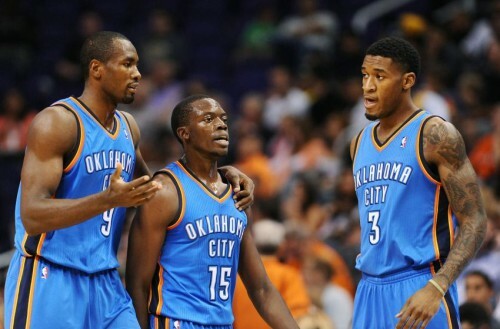 At least for the next month, the young players on the Thunder will be a lot like Ultron: free and without any strings. There will be frustrating moments during these next 4-6 weeks. It will be like watching one’s own kids going through their awkward teenage phase. But there will also be moments where the growth of these players will be on full display. And that can be nothing but beneficial for the Thunder. Remember, the silver lining in all of this is that all the significant injuries are only of the 4-6 week variety. If the team can win a couple games they are supposed to and steal a couple games they aren’t, they may be in position to make a big push as the calendar year turns. By January, everybody should be back healthy and ready to make their playoff push. The experience gained by the young players from now to then will be a valuable tool as the team heads towards the playoffs. And in case any one was wondering, they will make the playoffs. Mark it down. If there was ever a time for the entire world to go into hibernation for, ohh, I don’t know, maybe 6 weeks, this would be the time. The Oklahoma City Thunder will be strolling into Portland on Wednesday to open the season with 9 healthy players. The Thunder usually have a 10-player rotation in the regular season. They have 9 capable bodies, currently. The injury bug has hit the Thunder hard this preseason with Kevin Durant and Mitch McGary each suffering a broken foot, Anthony Morrow suffering a sprained MCL, Grant Jerrett still recovering from offseason ankle surgery, and Reggie Jackson (ankle) and Jeremy Lamb (back) each suffering injuries in the practice before the road trip. The only saving grace is that none of the injuries appear to be too serious. 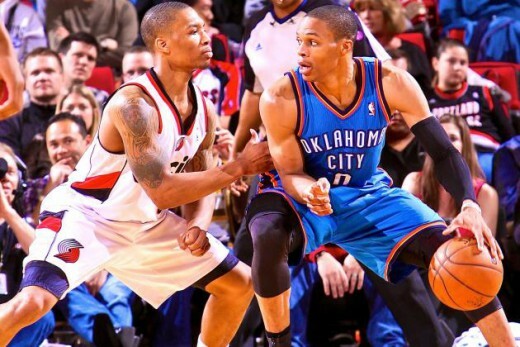 The Thunder and Portland Trailblazers split the season series last year 2-2. The Northwest division rivals played four close games, with all of them being decided in the fourth quarter and by single digits. The average margin of victory in each of the contests was 5.5 points. The Trailblazer start their season at home with visions of improving upon the season they had last year. Portland finished 54-28, good for 5th in their West. They defeated the Houston Rockets in 6 games in the first round and lost to the eventual champs in the second round in 5 games. Their entire core is back, and they picked up some veteran free agents for the bench. The only player missing who logged significant minutes last season is Mo Williams, who signed with the Minnesota Timberwolves in the offseason. With such comfort and continuity, look for Portland to once again be one of the top offenses in the league. Damian Lillard and Wesley Matthews are one of the top two-way backcourts in the league. Lillard and power forward LaMarcus Aldridge are quickly becoming one of the best duos in the league. On the perimeter, small forward Nic Batum is their best defender and someone capable of knocking down open jumpers. In the middle, Robin Lopez does a great job of keeping possessions alive with his energy. The bench, which was a weakness last season, has been shored up by veteran free agents Steve Blake and Chris Kaman. CJ McCollum and Thomas Robinson will also play a big role off the bench. 1. 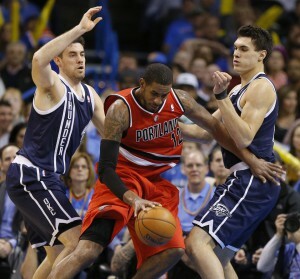 Foul Trouble – With only four warm bodies to come off the bench, the Thunder need to be very wary of their fouls. Steven Adams and Kendrick Perkins both have a propensity for picking up quick fouls, and that would be disastrous against a team with skilled bigs like Portland. On the perimeter, the depth is even worse. Sebastian Telfair is the only guard available for the Thunder off the bench. 2. Outside shooting – Oklahoma City’s top 3 perimeter shooters (Durant, Morrow, and Jackson) are out. The Trailblazers will be packing the paint, so making outside shots consistently will be necessary to win the game. All eyes will be on Russell Westbrook, which will leave Roberson, Jones, and Ibaka open from the perimeter. They have to knock down shots for the Thunder to even be in contention to win this game. 3. Westbrook – The great unknown. The fun unknown. We’ve always wondered what a team that solely featured Russell Westbrook would look like. Well, the Westbrook experience is taking off and we bought the Fast Pass. Let’s go!